What ever you call them.. I CROCHET them. Grooms, Bar and Bat Mitvahs and more! how to measure the correct size. How to order from Chadis Crafts. Custom order: Samples of beads. Custom order: Sample of Braids. Many more yarmulkahs in stock! Email me with your requests. and for all craft designs. A teacher and artist for over 30 years. Beaded, Braided, Lace and More! Like a fuller non lace head cover? Check out the 8" or larger traditional style headcovers. 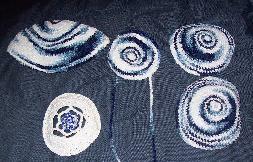 in solid and variegated colors. 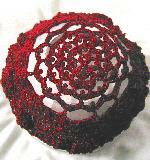 Petite Round Beaded Kippot 5"
with Metallic and Pearlized Yarns in solid and variegated colors. Lace, Beaded, Solids, Metallics and more! Simcah sets for Weddings, Bar and Bat Mitzvahs. and special sets for weddings, Bar and Bat Mitzvahs etc. All Kippot/Yarmulkas are priced each and shipping is extra. To see other great gift websites, go to my weblinks pages.